George Heinrich will go to great lengths, and depths, to draw attention to North America’s native turtles. Even into an over-your-head blackwater bend in the Alapaha River. Last month, Heinrich and Georgia naturalist Dirk J. Stevenson tread tea-colored water in a deep slough of the south Georgia river, testing the sluggish current, temporarily avoiding the swarming mosquitoes and probably toe-checking any available river bottom for a jagged shell that might reveal their targeted turtle: Macrochelys suwanniensis, the Suwannee alligator snapper. 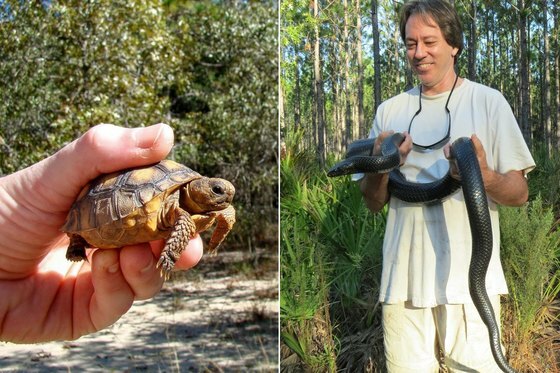 It was all part of the Florida Turtle Conservation Trust’s Big Turtle Year. Heinrich and Tim Walsh of the Bruce Museum are trying to see as many of the United States’ 59 turtle species as possible in 2017. See our blog for the full story and photos. You probably know that DNR’s Nongame Conservation Section depends largely on fundraisers, grants and direct contributions. You also may know that DNR’s eagle and hummingbird license plates are the leading fundraiser for the Georgia Nongame Wildlife Conservation Fund. But what you likely don’t know is that while sales of these plates are edging up, annual renewals are going down. That leaves fewer and fewer eagle and hummer plates on the road each year. Which means the base of support for conserving golden-winged warblers, parrot pitcherplants, northern yellow bats and hundreds of other species is eroding. What you can you do? If you don't have an eagle or hummingbird plate, please consider buying one. If you do, renew it each year. 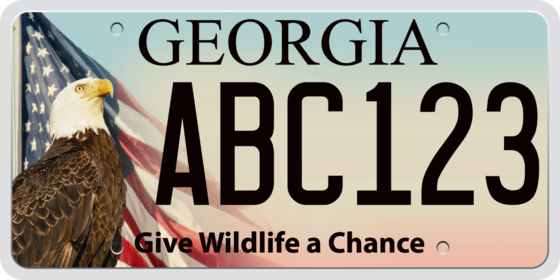 The cost is only $25 more than a standard state plate, and $20 goes straight to the Nongame Wildlife Conservation Fund. These plates not only look good, they do good work. And they show your support. Each fall, thousands of leaf peepers drive to north Georgia to enjoy Mother Nature's annual fall foliage show. During this eagerly awaited extravaganza, a kaleidoscope of colors stretches across the countryside. Blotches of yellow, red and orange transform the landscape into a tapestry of color. 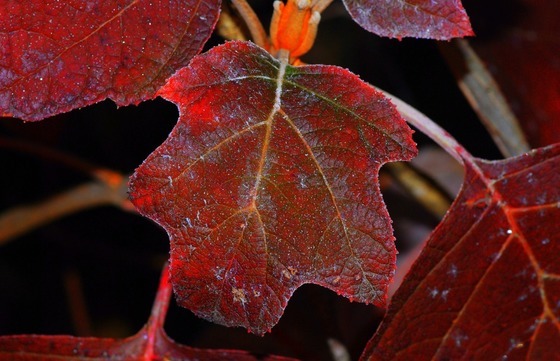 Read the rest of Terry’s column for tips on adding fall color to your yard. DNR’s State Parks and Historic Sites Division offers updates and viewing options. Two darter species in the upper Coosa River basin do not need Endangered Species Act protection, but one does. The U.S. Fish and Wildlife Service announced that while populations of bridled and holiday darters are “stable (and) being conserved through existing regulations,” the trispot darter should be listed as threatened. DNR is part of a collaborative effort to assess and conserve these species and frecklebelly madtom, also petitioned for listing. The work, a priority in Georgia’s State Wildlife Action Plan, monitored key populations of bridled and holiday darters in Amicalola Creek and the upper Etowah and Conasauga rivers (“Searching for rare darters,” Sept. 21). Both species will remain a conservation focus in the state. Comments on the proposed listing of trispot darters are due by Dec. 4. 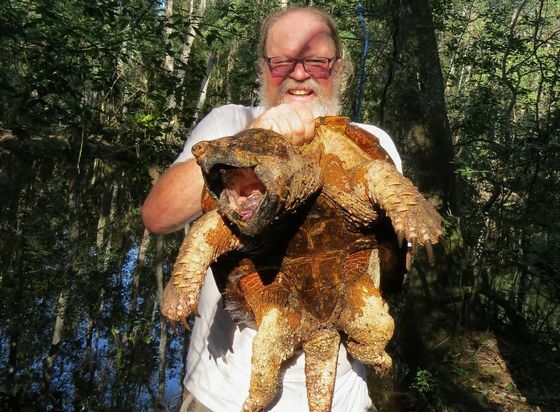 Barbour’s map turtle will not be federally listed either, the Fish and Wildlife Service said in a separate decision. The turtle is thriving throughout most of its range – the Apalachicola, Chattahoochee and Flint rivers and major tributaries. Six Georgia projects to restore wildlife habitat and water quality will receive grants from the National Fish and Wildlife Foundation’s Five Star and Urban Waters Restoration Program. The projects vary from creating a corps of young conservation stewards in Athens to restoring floodplain along Atlanta’s Proctor Creek and marshline and a tidal creek at Savannah State University. Deer hunting is here, with primitive weapons season opening Oct. 14 and modern firearms Oct. 21 (season details). While deer hunters are required to wear at least 500 square inches of daylight fluorescent orange above the waist during gun seasons, the same is recommended for hikers, birders and others in the field. The Outdoors GA app has multiple uses for all who enjoy the outdoors, whether its checking regulations, buying a lands pass or finding nearby wildlife management areas. The free app is available for iPhones and Androids. 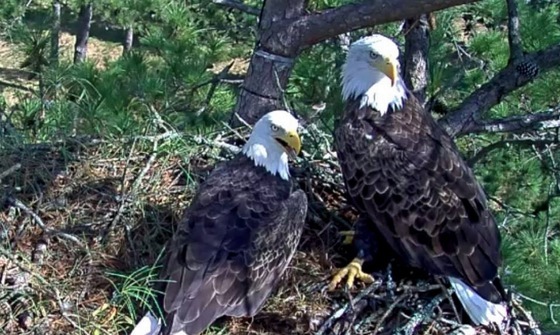 The bald eagles streamed by Berry College are sprucing up their nest and The Landings cam has videoed great horned owls in the nest ospreys used this year. Watch these and the Go Fish Education Center aquarium cam at www.georgiawildlife.com. When it comes to reptile and amphibian diversity, three of the top six Defense Department installations are in Georgia. Fort Stewart is No. 1 with 100 species, Fort Gordon is fifth (76 species) and Fort Benning is sixth (74 species), according to the "first comprehensive review" of the department’s 415 sites. Hurricane Irma brought an abrupt end to Georgia’s sea turtle nesting season, and about unhatched 300 nests. It is likely some turtles had hatched but not emerged from the nest – and the water helped them to the surface – while the state's more than 2,140 loggerhead nests still marked a strong season. Georgia teachers, take note: Oct. 16 is the deadline to apply for DNR’s $1,000 Conservation of the Year grant, available for 3rd- through 5th-grade educators in life sciences and funded by The Environmental Resources Network, or TERN, the Nongame Conservation Section's friends group. Women can learn outdoor skills including hunting and fishing, and even see what it’s like to tag alligators, in the Beyond BOW program Dec. 8-10 at Okefenokee National Wildlife Refuge, "land of the trembling earth." 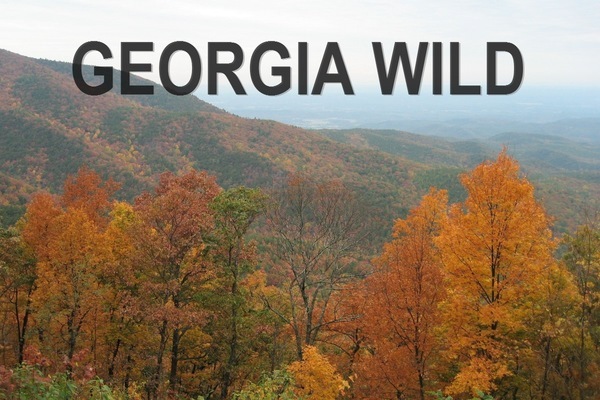 Names in the news: The Georgia Conservancy will recognize Gov. Nathan Deal as 2017 Distinguished Conservationist during the conservancy’s 50th anniversary ecoBenefete in Atlanta Oct. 12. DNR Law Enforcement Division Director Col. Eddie Henderson has been elected president of the National Association of Conservation Law Enforcement Chiefs. 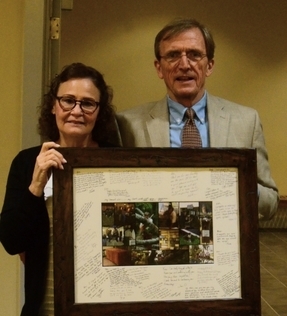 Nongame Conservation Section’s Ken VanHoy, who just retired from a do-it-all 15-year career that varied from setting up the peregrine falcon camera to working prescribed fires and replacing truck brakes, was honored with his wife Patsy (both at right with a photo collage signed by staff) during a dinner at Charlie Elliott Wildlife Center. 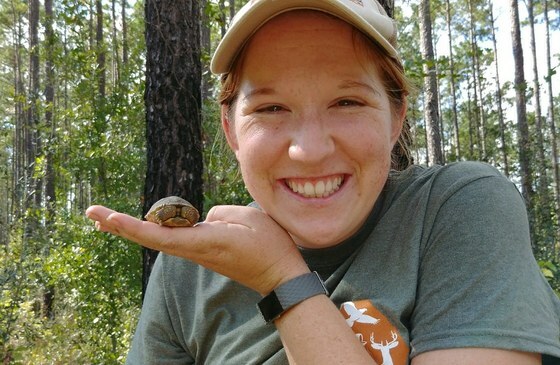 In snapshots from the field, wildlife technician Emily Ferrall (above) helped the Nongame Conservation gopher tortoise crew with surveys at Moody Forest Wildlife Management Area and Southern Co.’s Edwin I. Hatch Nuclear Plant near Baxley. One find at Moody was this hatchling tortoise. Bottom left, wildlife tech Marylou Moore also found a juvenile tortoise by its juvie-sized burrow at Ohoopee Dunes WMA. Bottom right, Andy Day, a wildlife technician, and naturalist Dirk J. Stevenson checked and released a 9-pound, 7-foot-plus eastern indigo snake in Irwin County. 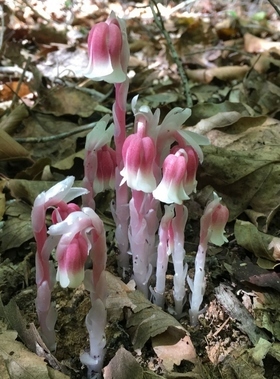 For a change of pace, at right are unusual the Indian pipes senior wildlife biologist John Jensen spotted in Jasper County. The plants are usually pure white. or hunted, plus Georgia’s native plants and natural habitats. DNR Wildlife Resources Division Nongame Conservation Section. All rights reserved.